« What does the customer REALLY want? I just had to grab the man, with the heartiest and biggest laugh in Cork, Pat O’Connell for the latest episode of the Fuzion Win Happy podcast. 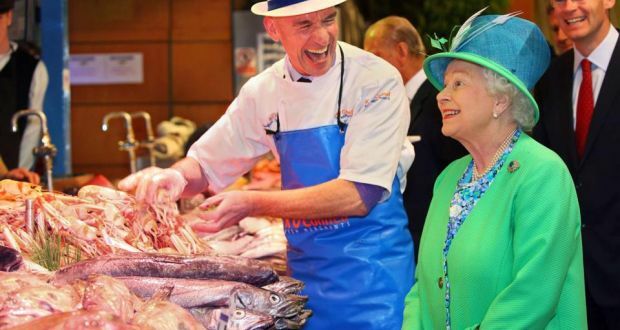 Pat, for those few who don’t know him is the famous fishmonger who is in that iconic photograph with a smiling Queen, during her visit to Cork. Pat runs the very successful Fishmerchants, K.O’Connell, in The English Market, which is now one of the popular attractions in Cork city for locals and visitors. In the podcast I explored his early career and what it was like to grow up in a hard working, entrepreneurial family where his clever mum, Kathleen understood what was needed to differentiate your business. While we all take the fantastic English Market for granted, Pat explains how this wasn’t always the case. Just like markets all over the world, it was a very functional, drab, market for locals, which opened a few times during the week and it required the clear vision of a few forward thinking people to change direction and evolve into the special place that we experience today. Pat’s story is one of a family business and succession. His mum, an early female entrepreneur with a gift for people started this business, which Pat joined full-time after a brief stint working for the City Council. His brother Paul works with him in the business and the next generation of O’Connell’s are also involved..
Like so many stories, there have been bumps along the way, including the passing of his mum, work partner and great friend, Kathleen, which has left Pat and Paul to take the special business into the future. Pat is a very proud Corkonian, a recent President of the Cork Business Association and anyone who has spent even five minutes chatting to him will understand why he believes Cork is the best place in the world to live and work. In our chat I learnt a lot about his business philosophy and he also shared some exciting news about a new development with Dunnes Stores, which will be opening very soon in the Bishopstown store. I hope you enjoy listening to Pat share his story as much as I did! Click here and enjoy the show.. This entry was posted on July 28, 2018 at 11:35 pm and is filed under Bereavement, Cork, Customer Care, Strategy, Tourism. You can follow any responses to this entry through the RSS 2.0 feed. You can leave a response, or trackback from your own site.